FirstDown PlayBook is hitting the road this weekend as the football clinic season begins in full force. First stop…Indianapolis for the Glazier 150 taking place January 18-20. 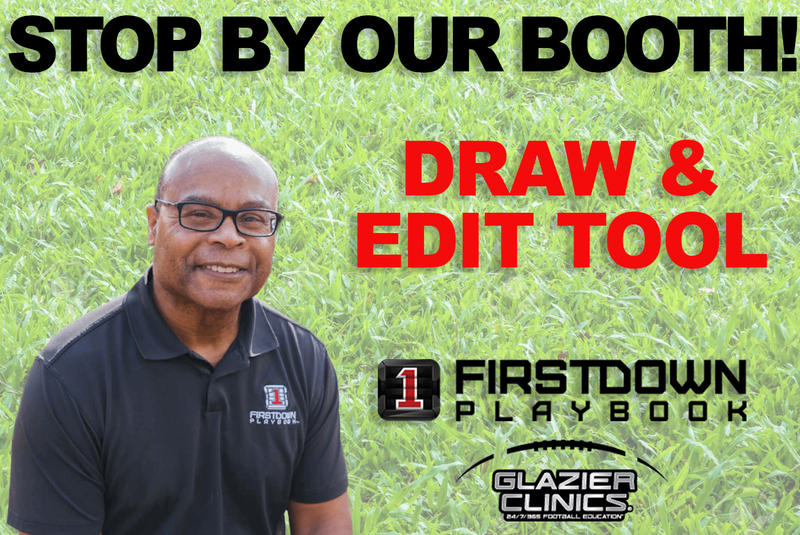 This clinic season is especially big to us as we are getting to show more and more coaches the new FirstDown PlayBook Draw & Edit tool that we just launched on January 6. You have seen it all over social media and you have probably heard us talking about it for more than a minute over the past months. Now it is live and if you stop by our booth in Indianapolis this weekend we will let you sit down and put your hands on it. When you do, you will see why drawing football plays, playbooks and practice cards will never be the same again. So first, please make sure you and your football staff travels safely as you work your way to the clinic and then, by all means, please stop by. Who knows there might be a clinic discount or two for those of you who do!